If you'd read through some of my wine reviews, it becomes pretty apparent that I am a red wine lover. The bigger and darker the red, the better! So, if you're looking for a lot of white wine reviews, you may have to look elsewhere. Okay, I do occasionally enjoy a white wine, but to me, they're more of a spring/summer type of drink. Anyway, enough chatter, let's get to the topic at hand: WINE. For now, we are looking at the Gnarly Head Cabernet Sauvignon, the 2009 vintage to be exact. This is another big and boozy California red from the Central Valley. They are called "Gnarly Head" because they focus on old vines, which of course, tend to produce less grapes per cluster, yet with more flavor. 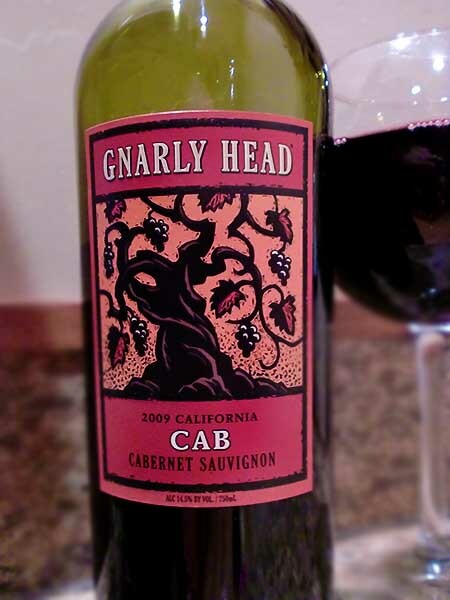 The 2009 Gnarly Head Cabernet Sauvignon pours a dark, dark ruby red. It has distinct cranberry and raspberry aromas. These cranberry and raspberry notes carry into the palette where they are forefront, full, dark and juicy. There's a touch of black cherry, pepper, and oak in the finish. The tannins linger, moderately strong, but that's expected for a Cab. Drink This: if you want an above average Cabernet Sauvignon in the sub-$15 price range. Don't Drink This: if you're looking for a super complex, highly tannic Cab. This one is fairly straightforward, yet exactly as a Cabernet should be.